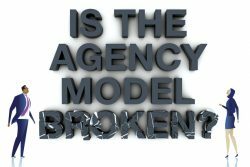 Agency Reviews: Is the Advertising Agency Model Broken? Home » White Papers » Is the agency model broken? We hope that you will find the following article about agency reviews to be helpful. If, after reading, you would like to explore our thought leadership on a deeper level, please contact Kerry Kielb at kkielb@bedfordgroupconsulting.com. The following article was featured in PRWeek by Rose Gordon Sala with insights about what is causing many agency reviews from The Bedford Group. ‘Inconsistent service’ Marketing firms, natural storytellers, appear poised to remake themselves once again. Efficiency now key The maker of Cheerios and Yoplait is undergoing a companywide cost-cutting initiative, like many of its competitors in the CPG space. And while “efficiency,” or time and money matters everywhere, including in agency selection – and the statements issued by numerous marketers in recent reviews peppered by that word, including P&G, Citi, Kraft, Mondelez and others, show it does – clients are willing to spend with firms whom they often view as relentless idea generators and knowledgeable guides to a fragmented media landscape. But increasingly that agency must work harder to impress – and in new ways. “It’s key to have best-in-class partner agencies that work together in propelling our brand,” notes Erickson, who works with Edelman, The OutCast Agency, and Group SJR, among others. “We believe the AOR model no longer works in today’s environment – we need multiple voices.” Reviews are a way of life at any agency, but the recent upheaval has put them on notice, particularly in the media sector where the digital evolution is not only once again upending services, but business models, too. “The last 10 years have been very turbulent for the agency industry,” says Kerry Kielb, senior consultant at The Bedford Group. “Obviously media has taken the biggest hit, and a lot of it is impacted by programmatic. It’s a lack of trust and an increase of audits. Sometimes the agencies don’t even know where the money is going.” Now, they suspect that figure is even lower. The downward trend is impacted by a number of factors, including the economy, but ultimately by a dissatisfaction with the marketing services being provided. “What’s always behind reviews is the expectation that there’s something better out there and more efficient,” explains Gail Heimann, president at Weber Shandwick. But with the advent of digital marketing, which seems to introduce a new tool, a different shiny social hub every day, that pace may have sped up the reviews. “There are new players, technologies, and distributors out there. It’s a brave new world, and people often think, ‘maybe I should get into it,’” she continues. “‘Maybe there’s a holy grail that I could find in this brave new landscape.’” Bedford says her team looks for firms that are “naturals for horizontal expansion” across disciplines, which is often spotted at agencies that understand how to leverage data and harness loyalty and the sales channel. And that may be the holy grail for marketers, an ability to work seamlessly across disciplines and to flex up and down as need be. It also seems to have led agencies to try to be all things to every marketer, with everyone claiming expertise in what was once the domain of another. “Everyone has rapidly expanded their capabilities,” adds Gareth Jones, chief brand and content officer at DigitasLBi. “There’s a soup of confusion and lack of differentiation, and that is what’s prompting reviews.” Dominic Proctor, president of GroupM, which houses WPP’s media buying firms concurs. “There’s so much confusion and noise out there that clients want to know if they’re spending the right amount of money in the right kind of ways,” he notes. “There’s a lot of questioning going on.” And the “questioning” spans disciplines. “Clients want to know how you fit into their mix. Are you collaborative? Do you have experience working across disciplines?” says Barri Rafferty, senior partner and CEO of Ketchum North America. But that blurry “soup” of services is also a boon for marketers in other ways. “There seems to be no specialized agency anymore,” notes Helen Limpitlaw, director of brand communications at Southwest Airlines. “It’s terrific from the client perspective. You’ve kind of got an all-you-can-eat buffet, and you get great work from it.” Southwest isn’t alone in sensing new possibilities. Coca-Cola made waves when it invited a creative agency – WPP’s Ogilvy & Mather – to join its media account review earlier this year. A more traditional media firm, UM, part of IPG Mediabrands, ultimately won the review, but the option was left open for creative agencies to work on media planning and buying going forward. That blurring can favor agencies, too, such as Grey where the advertising shop’s PR and activation division has “almost doubled in size year on year” in the last four years, says Claudia Strauss, CEO of the division. “The rate of speed of change is huge,” she adds, making people who can identify “a blurry opportunity and know what it means” valuable to firms. In other words: “You need a lot more magical unicorns,” Strauss explains. And proving you are one of those “magical unicorns” at an agency is getting to be more difficult. “There’s less margin for error and higher value placed on speed to market pace,” says Matt Jarvis, partner and chief strategy officer at 72andSunny, which boasts clients including Google and Carl’s Jr.